While wandering around Target, I stumbled upon a new Revlon display, hidden away and half filled in the middle of an aisle. 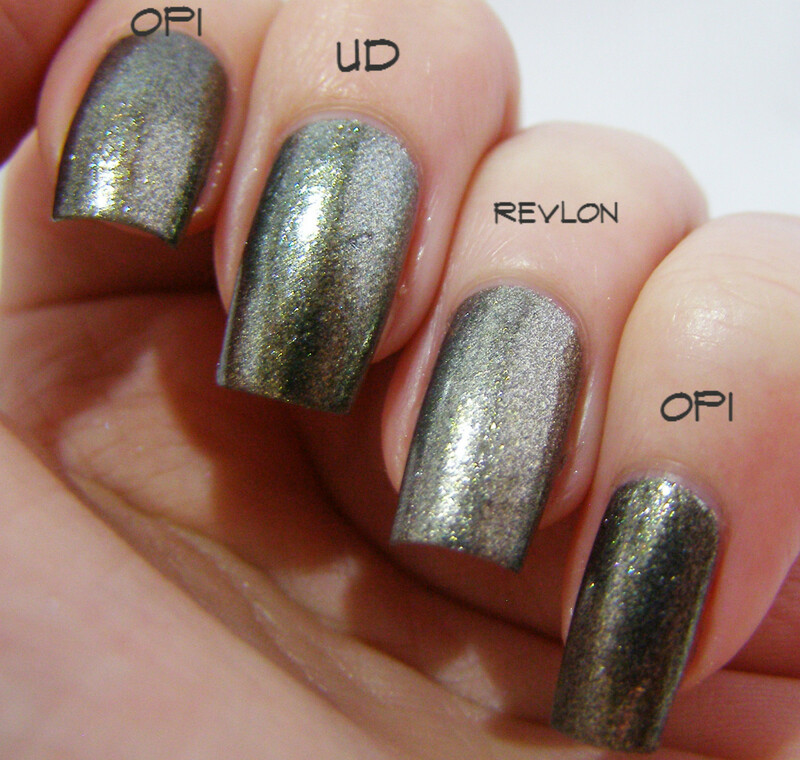 I had been planning on comparing the Urban Decay Addiction polish to OPI Number One Nemesis from the second I saw it. But I saw Revlon Rich and was instantly struck by how similar it is to Addiction. I had to grab it. It is a really nice polish, considering it's low price tag. It's got a taupey, kind of neutral base under all that luscious foily goodness. I think it'd be a fairly SFW color. It's a lot thinner than most foily polishes I've tried. It definitely lacks that "frothy" texture that I love/hate. 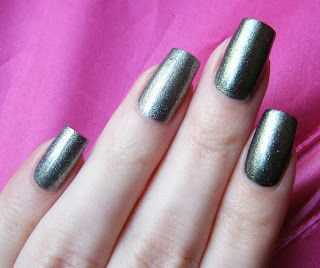 It would probably take only two coats for opacity on shorter nails, but I used three to be sure. There was a little streaking, but not enough to be off-putting. Rich is so close to Addiction. It's the taupey sister of Addiction. It lacks that oomph, that pizazz that Addiction has. It's just a little flatter to look at. Addiction has a darker, more green background that gives it life. It also has more variation in the sparkle, which is nigh-on impossible to show. I honestly thought, when I first applied Addiction, that I had been wrong about it being a dupe for Number One Nemesis. I (falsely) remember Number One Nemesis being silvery, not green at all. Apparently, I'm an idiot. It's a dupe. Completely. I actually had to put dots on my fingers so I wouldn't mix them up during the painting. The only difference is the formula. Number One Nemesis is thin. Watery, in fact...I gave up after four coats. 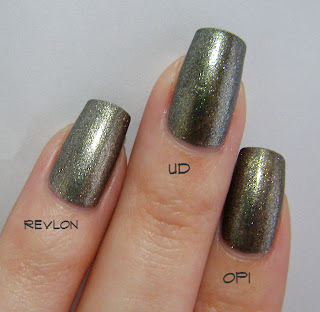 So the tl;dr here is: Urban Decay duped an OPI color. Both are a bit pricey: $8.50 for 15ml and $15 for 9ml respectively. Revlon Rich is damned close, and it's only $3.99 for 14.7ml. 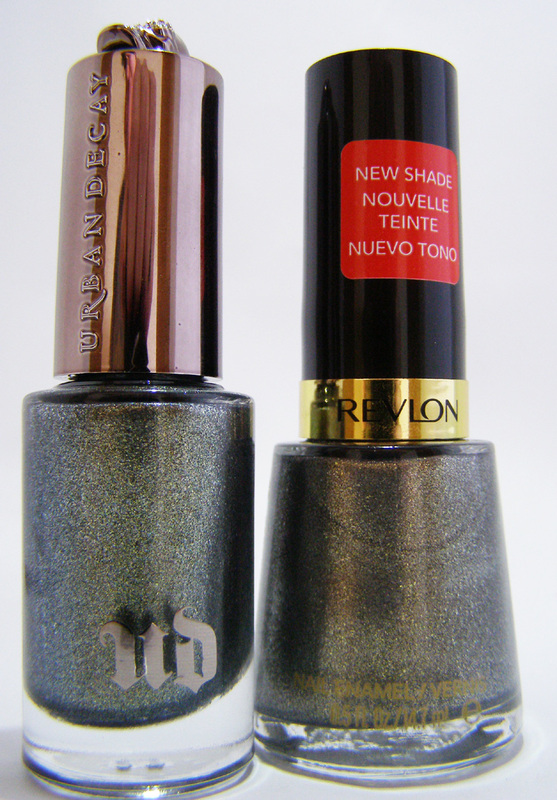 If you aren't a fangirl, buy the Revlon. It's close enough. 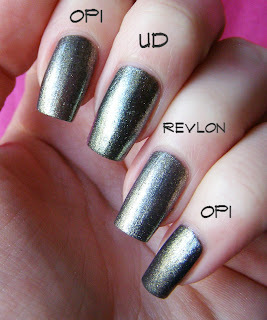 Hmmm, looks like Revlon Carbonite has been re-released into this new incarnation. Tho it seems like Carbonite isn't really sheer from what I can remember. All of them are pretty colors ! It's way more khaki than Carbonite. It's not as green as Addiction or NON, but its definitely a passable dupe. I clearly need it, lol. Is it kind of Shoot the Moonish ? pretty similar, yeah. Slightly different undertones, though.